Welcome to the brand new MarathonMan Europe website! 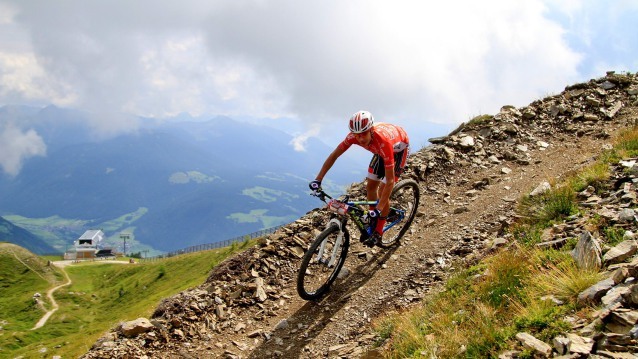 Five top events in Germany, Italy, Austria and Czech Republic are part again of the popular international 2019 Mountain Bike Series. Some of the races have already more than 20 years experience and are therefore an annually fixture for many bikers. Once again more than 11.000 contestants are expected participating at all five events. The 2019 season kick off is the Author Kral Sumavy in Klatovy/ Czech Republic. This traditional race takes place already for the 26th time and participants may anticipate an international starter field as well a great atmosphere at and beyond the race tracks; just the mere start at the historic city center of Klatovy is a one of kind experience continued by the flow along the most beautiful trails of the Bohemian forests – an ultimate bike pleasure. Two weeks later the series moves on but stays in the Czech Republic. Jablonne is the venue of the 20th Malevil Cup – one of the biggest mountain bike events in south-eastern part of our neighboring country. On four distances the tracks also lead across the German border and are full of numerous scenic as well as technically challenging highlights of the Lausitzer- and Zittauer mountain range. As of mid of July the series becomes really intensive for the participants. Kick off for three races within four weeks (!) is the 22nd Salzkammergut Trophy in Bad Goisern. Austria’s biggest MTB marathon attracts more than 5.000 bikers from 40 nations to the Dachstein - Lake Hallstatt Region. A selection of seven courses in total: from a 22 km rookie track up to smashing 210 km track. The trails lead through the most beautiful parts of the World Heritage Region being also most enjoyable experience. Just a week later Kronplatz King in South Tyrol is again part of the the Marathon Man Series. This point to point race with start in St Vigil at 1.205 meter elevation leading the participants via challenging up-hills and long adrenaline-rush free-ride down hills to the finish line at the 2.275 meter high Kronplatz. A most unique race surrounded by the breathtaking Dolomites mountain range! However please note this race is limited to 800 participants! The traditional final of this series will be at the oldest MTB marathon in Germany in the first week of August – the EBM100 in Seiffen. Already for the 27th time this top-organized event including three different courses takes place attracting more than 1.800 ambitious bikers to the Erzgebirge every year. The final in Seiffen will also celebrate the MarathonMan Europe winners’ ceremony. The best three athletes of each category will be awarded. The MarathonManEurope - Europe‘s most popular Marathon Series!